Most adults have 32 permanent teeth – 16 each on both the upper and lower jaw. Our third permanent molars, also known as the wisdom teeth, usually erupt between the ages of 17 to 25. 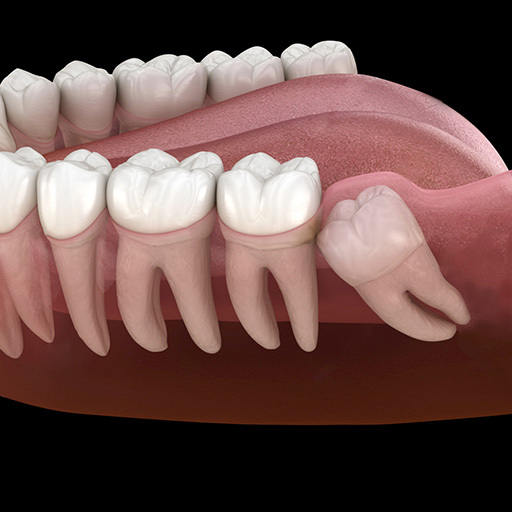 There are 4 wisdom teeth, located at the ends of the upper and lower jaws. It is common to have one or more wisdom teeth missing. For some people, their wisdom teeth can normally erupt, while for some others, their wisdom teeth may not successfully erupt and may become impacted. For most people, their wisdom teeth will be blocked from erupting completely in the mouth by the permanent second molars or the surrounding bone and/or gums due to the smaller jaw space. These wisdom teeth are considered to be impacted. Treating impacted wisdom teeth is the most common reason why your dentist will recommend them to be extracted. The impacted wisdom tooth may partially emerge (partially impacted), showing only the crown of the tooth, or never emerge through the gums at all (fully impacted). The wisdom tooth may also grow at an angle towards or away from the second molar, or grow at a right angle, almost as if it is “lying” down. Since it is difficult to clean the surfaces between the impacted tooth and the adjacent tooth in front, dental plaque will accumulate there and cause tooth decay on these tooth surfaces. The inflammation of the surrounding tissues caused by the dental plaque, together with the pressure of the wisdom tooth pushing on the adjacent tooth in front, may cause the root of the adjacent tooth to resorb. Cyst around the wisdom tooth can damage the structure of jawbone. It has to take balance between the risks and benefits of the surgical extraction of tooth. In some cases, the impacted wisdom tooth is deeply embedded in the jaw bone and its roots are close to main nerve, surgical extraction may impose risk of damaging the nerve, leading to numbness of the mouth. Therefore, the decision on removal or not or when to remove the wisdom tooth is dependent on clinical situation. The dentist will take radiographs to confirm the position and shape of the wisdom tooth, and explain to the patient on the situation, procedures and any risks. Usually, the procedures will be done under local anaesthesia (numbness of mouth only), but in some cases, it may be done under general anaesthesia or under sedation. The procedures should be painless. One week after extraction, remove the sutures by the dentist who will check the healing of the wound. If the suture is of self dissolve type, then it is not necessary to remove the sutures by the dentist. However, it is still necessary to let the dentist to check the healing of the wound. In general, the wound will heal within 2 weeks.